Look trendy in this soft hooded pullover with an attractive V-neck, raw-serge edges. ?á9.0 oz, 60/40 cotton/polyester brushed fleece. ?áThick white drawcord. ?á2x1 rib trim on waistband and cuffs. ?áRaw edge seams around hood opening. 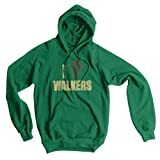 The 100% cotton Walking Dead No Walkers T-Shirt lets people know that walkers are certainly not appreciated! From AMC and their hit television show, the Walking Dead! Zombie Outbreak Response Team sweatshirt. This zombie shirt is a must have! Have you tried a Crazy Dog T-shirt yet? Just Wait until you slip on one of these super soft tees. You'll instantly fall in love! Not only are they printed on super soft cotton but the tees fit great too. Try one and you won't go anywhere else! With over 900 designs Crazy Dog is the online destination for your favorite tees. Many of our designs are available in mens, womens, and youth sizes and come in a variety of different colors. Check our store to see them all! 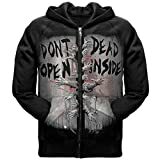 This adult Walking Dead Hoodie Zipper-Fleece sweatshirt is an officially licensed product and features our cool Daryl Dixon Costume design printed on soft polycotton. 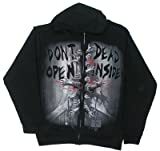 This hooded sweatshirt features blood-stained printing on the front and back, including Daryl Dixon's signature ear necklace and cross-bow. Also included is a zipper front and side pockets. This charcoal grey full-zip hoodie is 100% cotton. It has two front pockets and ribbed cuffs and bottom. The zipper pull is a silver-colored biohazard symbol. The front length of the hoodie (from where the hood meets the shoulder, down) varies with size. Front length measures: Small-26", Medium-27" Large-28", XL-29", 2X-30", and 3x-31". 9.3 oz, 50/50 cotton/polyester. Â Double-lined hood with matching drawstring. Â 1x1 athletic rib knit cuffs and waistband with Lycra. Â Double-needle stitching throughout. 50% Cotton & 50% Polyester Blend Hoodie with the design on the front side. Professionally made in USA. HiveTees offers its customers the highest quality prints at the lowest price. We exclusively use the American Apparel shirts and sweatshirts to ensure excellence.We produce every garmet completely custom according to your order. Because of this, we Do Not accept returns. Due to the labor that goes into each product, we accept exchanges only in limited circumstances. Please order accordingly and review our Return Policy.Please note, all images are representations of the final product and do not take larger or smaller shirt sizes into account. This image approximates the graphic on a medium sized shirt.Unlike typical synthetic fleece, the California Fleece hoody is made of 100% extra soft ring-spun combed cotton, pre-laundered for minimal shrinkage. It's thick for extra warmth but maintains breathability. 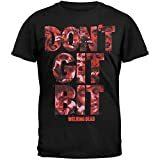 The 100% cotton Walking Dead Don't Git Bit T-Shirt plays off a crucial rule in zombie apocalypse survival - Don't get bit! Inspired by Robert Kirkman's hit TV show and comic book, the Walking Dead! Martial arts expert, Harry and his wife, Hannah arrive back in England after a sailing trip to discover a deserted city of London. They become increasingly frightened as they wonder why there is no traffic, no movement, no people, no noise, nothing...all very spooky. The married couple reach their country cottage and discover teenage Zombies, dressed in hoods, have infested the land, killing and eating any living thing that moves, including humans. Then Harry joins an underground community of disabled people, the Crips, who are deemed untouchable by the Zombie Hoodies, and so, are destined to be the last living human survivors on earth. The Crips exploit their immunity and persuecute the Hoodies, who finally realise that disabled people are no different to "normal" humans, and so begins the Last Battle between the Hoodies and The Crips.